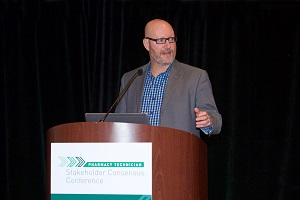 WASHINGTON, DC -- Pharmacy and pharmacy technician leaders from multiple practice sectors gathered in Irving, Texas, February 14-16, to explore consensus on standards and qualifications for entry-level and advanced practice pharmacy technicians. Hosted by the Pharmacy Technician Certification Board (PTCB), the historic 3-day Pharmacy Technician Stakeholder Consensus Conference brought together more than 100 individuals on-site to provide input to PTCB and develop recommendations that support the evolution of pharmacy technician roles as pharmacists take on increasing responsibility for direct patient care. More than 350 additional pharmacy and pharmacy technician professionals participated by interactive webinar. Participants included pharmacists, pharmacy technicians, educators, employers, state and national pharmacy associations, state boards of pharmacy, accreditors, and members of the general public. 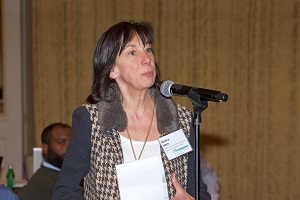 The conference featured keynote speakers, panel discussions, and daily work group sessions. Four expert panels discussed the technician workforce, optimal requirements for entry-level technicians, opportunities in advanced technician practice, existing state-to-state inconsistencies in technician regulations, and successful models of standardization, including those in place in Canada and North Dakota. Participants broke into work groups to develop statements on educational requirements, reduction in state-by-state regulatory variations, recognition of competencies of advanced technicians, and the need for public confidence in pharmacy technicians’ knowledge, skills, and abilities. PTCB planned the event in collaboration with the American Society of Health-System Pharmacists (ASHP), the Accreditation Council for Pharmacy Education (ACPE), and an advisory committee comprised of pharmacists and technicians representing various sectors of practice, technician educators from community and health-system-based training, national pharmacy organizations, and state boards of pharmacy. 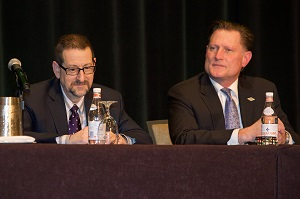 Results from a pre-conference, profession-wide survey informed conference deliberations. Conference proceedings and complete recommendations will be submitted for publication later this year. View the Advisory Committee roster.